One in three named Star Wars characters is a straight, white human man. Three in four are male. I know that because I’ve done the math—both before the reboot and ever since. If you’ve followed this blog for a while you probably know that, but I find it helpful every so often to restate my case for people who haven’t kept up with this particular project of mine (though the older pieces are of course still available). Once a year, I take it upon myself, with a big boost from Wookieepedia, to tabulate every named character from the previous twelve months1 of Star Wars novels, films, and television, and calculate how many are straight, white human men (hereafter WHMs), and separately, how many are males of any kind. The percentage of a story’s cast that does not quality as WHMs is what I call its diversity score—for example, one WHM in a cast of ten would means a score of 90. The percentage of non-male characters I call the parity score, with an implied “ideal” score of around 50.2 Diversity scores have much less of an objective “ideal”—the occasional story with no WHMs would hardly be the worst thing to happen, but in a perfect world I’d say an average score in the high eighties/low nineties would be pretty good. That said, we are nowhere near either of those targets, and that’s why I do this. The numbers can of course be broken down much further and endless productive discussion can be had over how intersectional the human cast should be, the ideal amount of LGBTQ representation, the ideal amount of aliens and droids, and most important of all, the strength of the characters as conceived and portrayed—but the bottom line is we’re not where we should be, and this is my way of looking at the big picture of representation and whether things are moving in one direction or another, so that we might decide how to move forward. That is a question with many, many good answers, none of which I claim to offer here. So where are we now? It depends on which area you want to look at. Rogue One warrants a lot of attention as this year’s film release, but its lower-than-average scores were buttressed by slightly lower scores from the third season of Star Wars Rebels, as well—this is unfortunate but somewhat understandable, as Rebels is getting ever closer to A New Hope and thus bringing in more and more characters from the hyper-male, lily-white original trilogy. This increased (obligation? desire?) 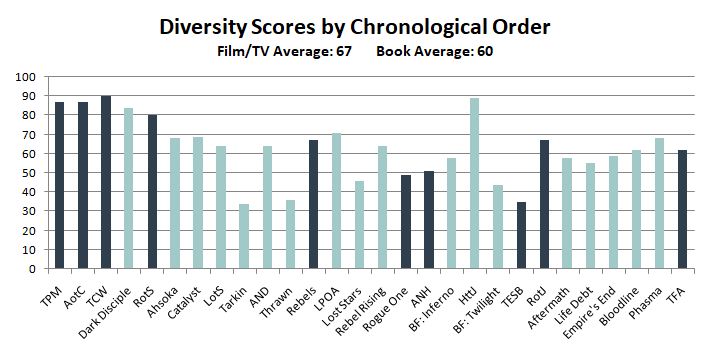 to mimic of the OT’s demographics brought the film/TV diversity score down from 70 to 67, and the parity score down from 22 to 21. Five points may not sound like a lot, but remember that the “ideal” is only 50, so going from 22 to 27 is pretty significant, especially since that’s a cumulative score for the entire canon—if you isolate the eight novels I added this year, the average is just a hair shy of 33. It’s maybe a little depressing that “only” two in three characters being male could be seen as a noteworthy improvement, but that just underlines how bad the numbers were a year ago. There are two books I’d like to highlight here—first off, Phasma deserves recognition as the first major canon release to pass 40% parity (followed closely by Ahsoka and Leia: Princess of Alderaan), and secondly, Timothy Zahn’s Thrawn managed to hit the year’s average of 33 dead on—while this was his canon debut and thus the first time I’ve done a parity score for him, I think that presents a very interesting contrast with James Luceno’s Tarkin, an early canon book from which you might expect very similar numbers—both focus almost exclusively on Imperials, both feature lots of characters with brief appearances and no descriptors (which I count as WHMs—proactive representation is the goal here), and both are written by old-school sci-fi authors of, let’s say, a certain generation. 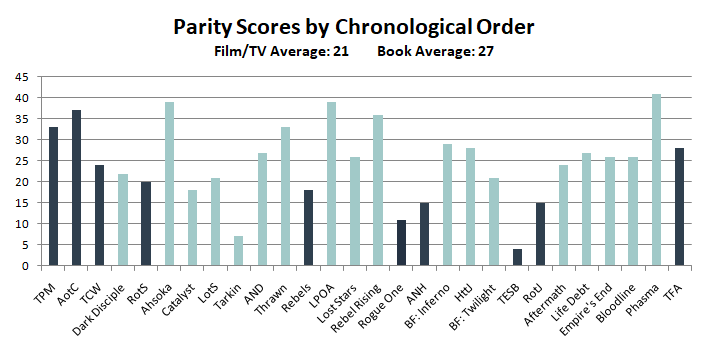 Indeed, the two books’ (predictably low) diversity scores are almost identical, but Thrawn‘s parity score of 33 is miles beyond Tarkin‘s pathetic 7, the lowest score in the entire canon. While I mostly loved what Zahn did with Arihnda Pryce, note that under this system she doesn’t count any more or less than a named character who exists for one paragraph, and that’s where the book made real strides—it’s easy to bring in a character for two seconds and not mention their skin color, or even their species, but not establishing their gender is much, much less likely; for all the visibility of Pryce and Rae Sloane and Phasma, I’d venture to guess that Thrawn introduces more female Imperials into the canon than any other work, simply by bothering to try. Between the panels: how do the comics fare? Ryan took this project on with the goal of eventually writing a guest piece of his own about it, but when all was said and done, the most noteworthy thing about the data was how typical it was—an average diversity score of 68 and an average parity score of 26. I am happy to report that here too parity went up distinctly from one year to the next, and that the Kanan and Han Solo series deserve special recognition for passing 90% diversity and 40% parity respectively; any further revelations will have to wait for the next batch of figures, as Ryan has graciously agreed to keep at this and let me know if anything interesting happens. If you take a few steps back and look at the past year overall, the most interesting thing is that the novels and comics—while not perfect—have improved measurably when it comes to depicting a realistic balance of male and female characters, yet the biggest Star Wars release of all, Rogue One, had the lowest rate of female characters in a film since The Empire Strikes Back. I love Jyn Erso to death, and Mon Mothma was also used particularly well, but beyond the two of them there’s barely a female presence in the movie at all. While opinions certainly differ on the need to present a diverse Empire, it’s very hard to justify the tiny number of female Rebels—only one of whom even warrants a name in the credits, further hurting the film’s parity score. Once upon a time, this disparity was something the entire universe had to deal with; when Admiral Daala debuted and offered the Expanded Universe a vehicle to explore sexist attitudes in the Galactic Empire, that became effectively the official reason for why no female Imperials are seen in the original trilogy (there were no Imperials of color, either, but interestingly, human racism was a little too much for Star Wars to handle so we were left to assume they were just off-screen). Since the reboot, though, things have gotten a little murkier. 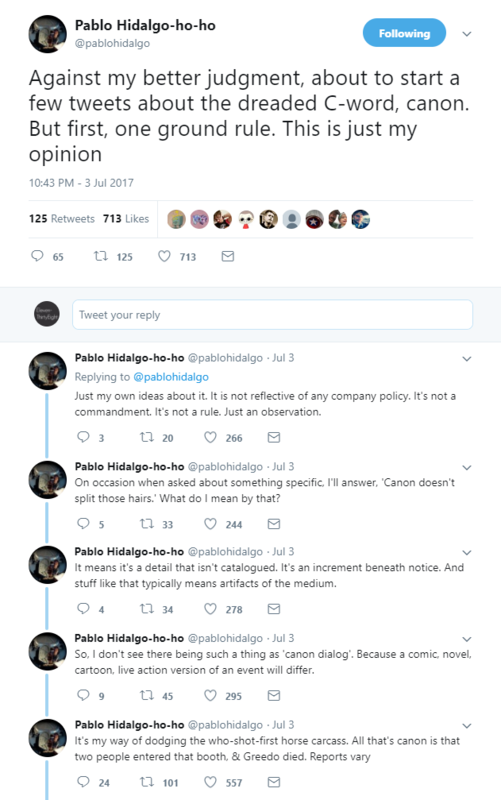 Over the summer, Pablo Hidalgo broke one of his rules and issued a brief and illuminating series of tweets about how he personally thinks of canon—that only the broad strokes are really “catalogued”, since the details, even dialogue, will often change from medium to medium. Greedo and Han sat down at a table and only Han walked away; who shot first is “an increment beneath notice”, and therefore fans are largely free to decide which version they prefer. Having lived through innumerable retcons over the years (ingenuous though some may have been), this strikes me as an incredibly sane way to see things, and to mitigate the need for stories to bend over backwards to align perfectly with each other when absolute synchronicity across mediums will never quite be possible (or, frankly, desirable). Any excuse to use a Phil Noto drawing, really. But what I’ve been wondering lately is, what does this approach mean for in-universe demography? Leave Rogue One aside for a moment—in the leadup to TFA a couple years ago, Smuggler’s Run introduced ISB Commander Beck, who noted to herself how hard it was for a woman to work her way up to that rank within the Empire. While Beck’s experience is subjective and shouldn’t be seen as gospel anyway, once upon a time, that line would have been the ballgame—as much as Imperial sexism might be out of favor with the current slate of creators, in one sentence it would have become an Established Thing, and a character like Rae Sloane would have been expected to grapple with it in some way. 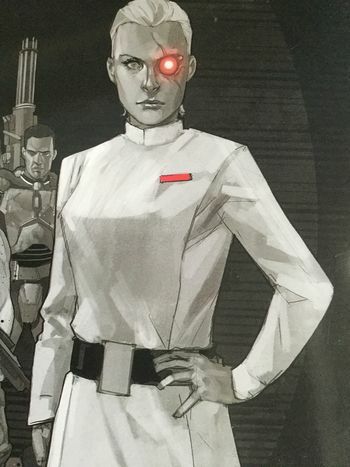 But Sloane became the leader of the Imperial Navy, and at least explicitly, she never really did; the implications of the Beck line were completely ignored. I can’t help but think that’s a good thing, but at the same time, how far can that go? If Gareth Edwards wants to make his Empire a WHM-fest in stark contrast to JJ Abrams’s more inclusive First Order, does foggy canon mean we shouldn’t sweat it as much, that there doesn’t need to be an explanation for that difference? I don’t want to ignore the real-world element of this—the presence of women in a wealth of different roles is first and foremost a positive thing for young fans of all genders to witness, and continuity should be a distant secondary concern. But speaking as the guy who adds these things up and tries to make sense of what’s happening within the universe, is it reasonable now to just ignore when stories don’t have the kind of demographics I’d like them to? Echoing Davidson’s position, one of the criticisms this series tends to attract is that focusing solely on in-universe characters ignores a more “real” problem—the creators themselves. A Star Wars film has never been directed by anyone other than, well, a WHM (and won’t be for at least the next few years), and historically the supplementary material hasn’t done a whole lot better. I fully concede that this is something I haven’t touched on as much as I could, and when Ryan Malin pointed out that the comic book with the highest parity score, Han Solo, just so happened to be the only one up to that point written by a woman, Marjorie Liu, I started thinking about the scores differently. 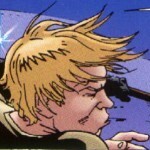 Marvel followed Han Solo with a Rogue One adaptation by Jody Houser and a Phasma mini by Kelly Thompson, the latter of which looks like it might be the first Star Wars story to boast a parity score over 50, but looking at their Star Wars line overall, and especially when you factor in the entire creative teams, they’re far, far away from a real-world gender balance. The novels, on the other hand, are doing surprisingly well following a particularly female-author-heavy year—of the eighteen canon books I’ve scored so far, eight have been written by women, for a real-world parity score of 44. Not only does this mean real people getting real opportunities they weren’t before, but the record-high parity scores for the Han Solo mini and the Phasma novel demonstrate that, shock of shocks, more diverse creative rosters translate into more diverse stories, killing two convorees with one stone—in fact, the parity score for those eight female-written novels is nine points higher than the score for the male-written novels, 32 to 23. There’s a similar gap in average diversity scores, but even the women only get up to 65, meaning this doesn’t solve our WHM problem. While they’re doing better than I might have guessed, it’s clear that this is still an area with lots of room for improvement, and hiring some women of color would be a great next step. I hear Nnedi Okorafor is popular. This is important work and I am grateful for it, but “killing two convorees with one stone” may be my new favorite phrase. As long as neither of them is Ahsoka. Now, totally understanding your reasoning to avoid MG books and the like, what useful data could be culled from them? I’m thinking of the Adventures in Wild Space, the main family is an equal balance of (white) people, but the cast is heavily alien, with a single white villain (that I remember), and a prominent Woman of Color. The Servants of the Empire series seemed to have a good diversity ratio, with a pretty bad gender parity. Or even Join the Resistance is kinda tanking on gender but the diversity ratio seems higher. Well, let me rephrase this question. Ryan did the comics for you. If someone (probably not me) offered to do the Middle Grade readers, would you add those? Or are they fundamentally different enough from this “SW Unit” you wouldn’t include it if it was handed to you? Just curious. I really appreciate the work you’ve done, I just wanna ask about the methodology a bit. I’m just curious if we’d see the same thing, for the most part, that you’ve tracked well. I actually started scoring Servants early on but I ultimately decided against it—partly for the reasons I discuss here, and partly because the volume of middle grade books would eventually give them an outsize importance in my averages. Do they deserve to count? Arguably, but there’s something like twice as many as there are adult/YA novels, and I don’t think they should count that much. That said, after seeing Ryan’s comics data I do kind of suspect that they might average out roughly the same. There’d be higher highs (like GotW scoring 100) and lower lows (SotE) given their smaller casts, but the distinction may well come out in the wash. If someone did take it upon themselves to score them, I’d be interested to know what they learned, but I would still keep that data aside from my main numbers, just like I did with the comics. I appreciate the points you make towards the need for diverse creators (how more women authors brought more diverse characters to the table) and how creating diverse casts needs to be deliberate. I recall a tweet from an author that said something to the effect of “everything in a story is forced,” since it’s being created from fiction. Having a WHM-filled cast is just as “forced” as a diverse one. Here’s my question. Is it fair/accurate to have unsubscribed characters assumed to be WHM? For one, if these are characters that aren’t described, they may be relatively minor characters – does a handful of minor, faceless characters really diminish the prominent roles given to Diverse characters? Second, I’m wondering if some of this approach of simply assigning the non-designated as WHM doesn’t end up projecting your own bias and concerns. I think taking a non-description and importing a description is a bit reader specific, that it is a matter of a reader importing his or her own images and placeholders into the book. I say this because I’ve just finished reading “From a Certain Point of View” and am in the middle of Ken Liu’s new Luke Skywalker book. Especially in Liu’s book, I noted that there was often a decided lack of descriptors for the new characters beyond gender (and there seemed to be a lot of parity, but I didn’t do the math). I would imagine that these give readers a wide variety of characters that they can latch on to and identify with and even basically insert as a proxy of themselves. Is it “fair”? YMMV. What I’ve learned from several years of doing this is that any set of rules I could imagine will be unfair to someone, sometimes—that’s why I take pains to use these scores for big-picture observations and not direct criticism. That said, the line on WHMs being drawn where it is is the result of a great deal of consideration over a number of years, and I discussed my reasoning extensively in the original Minority Report piece. does a handful of minor, faceless characters really diminish the prominent roles given to Diverse characters? Not universally, but in some ways, yes—as I said, Jyn is awesome and Mothma is awesome but that doesn’t make it fine that they’re almost alone at Base One. Likewise, the many POC in both the main cast and the background doesn’t mean parity no longer matters—diversity is intersectional, a story isn’t just good or bad based on a single metric. I think taking a non-description and importing a description is a bit reader specific, that it is a matter of a reader importing his or her own images and placeholders into the book. Again, see my earlier piece—I am indeed importing biases, because historically those biases are almost always borne out. You’re right that some authors just habitually tend not to use descriptors, and it doesn’t correspond to them being good or bad at diversity—which is why I don’t hold these numbers up and say, for example, “Tarkin is bad because it got a 34″. What I would do is say “”Tarkin‘s 34 makes it much less diverse than Catalyst, which got a 69″. I consider that to be a statement of fact, with or without a handful of assumptions on my part. The basic principle is, if I’m the type of reader who wants to assume every single character is a white guy, does the book do anything at all to dissuade me? I’m not saying it absolutely needs to at all times, but I’m damn sure not going to call a group of blank slates “diverse”.